The black revolt duo 20W Dual-Port USB Car Charger from Moshi is equipped with two USB charging ports for charging your iOS mobile devices and any other portable electronics that recharge via USB. Each port delivers 2.1A for fast charging while you're on the road. Additional conveniences include an LED indicator as well as overcurrent and overcharge protection. 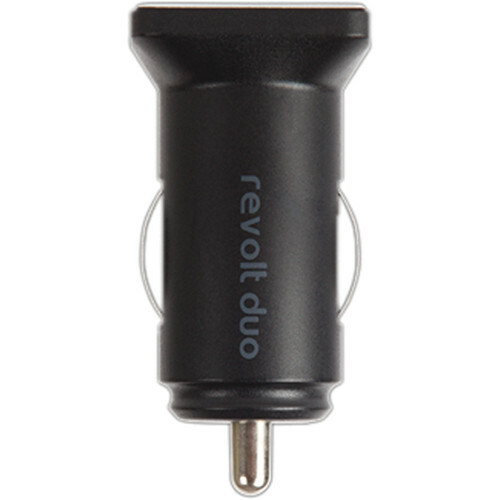 Box Dimensions (LxWxH) 6.9 x 1.9 x 1.2"
revolt duo 20W Dual-Port USB Car Charger (Black) is rated 4.8 out of 5 by 4. Rated 4 out of 5 by womanpower from Charges well, not as Low-Profile as you'd think I use this charger in a 2015 Ford Escape with a Droid phone. No cord comes with the purchase of the charger, so be prepared to provide your own, or purchase one from this site. The lack of cord was not clear in the product description, so I wanted to be sure to mention it in the review. It is a solid unit. I have owned other chargers that feel like the two halves of the plastic case will separate when you insert them into the outlet. This is very solid. The LED indicator is visible through the Moshi logo, not a independent LED indicator light. The LED is VERY dim, which will please those that want a low or no light situation. In my opinion, the fact that Moshi advertises this LED as a feature is a bit laughable. The charger isn't nearly as flush (Low-Profile Design) as you would think. The charger sticks outs of my outlet a good half inch (see photo). This might work okay in cars that have a flexible outlet cap, but the Ford Escape has hinged, rigid outlet caps. So for my situation, there is no hope of leaving it in the outlet and putting the cap on it. It charges well (and quickly) and I have no issues with charging performance. Five stars for performance, but four stars for the aforementioned finer points. I would recommend this product for charging, and B & H for the purchase of this product. Rated 5 out of 5 by Matt in Houston from Well built, low profile and works as advertised! I spent a lot of time looking around and researching car chargers, as I wanted one that would provide dual output, and the same high charge to both ports. I finally gave the Moshi Revolt a try, and it was the right decision. The car charger costs a little more money than most, but I believe you get what you pay for in this case. It is a solidly built charger, and has a decent low profile design (doesn't stick out much), but it is still easy to take out with you if needed. Both ports put out the same volts/amps, so charging dual iphones or ipads is not a problem. I paired this with a pair of Xuma 6' lightning cables from here (B&H) which gives my kids plenty of room to move around the car. Another BIG plus when you order from B&H is the assurance that you are getting the actual advertised item, not the common bait and switch you see on other sites. It takes the guesswork out of knowing whether you're getting a decent product or not. This car charger has been in use daily since we got it a couple of weeks ago, especially with the recent pokemon craze. Glad I bought it. Rated 5 out of 5 by Nelson from Quality Car Charger This charger is great for charging your phone when you're driving around. Rated 5 out of 5 by Anonymous from Very Fast Charger, Would buy Again This is a super fast charger. I wished I would have bought this years ago instead of all the cheap ones that I have bought and had to replace. No disappointments here.